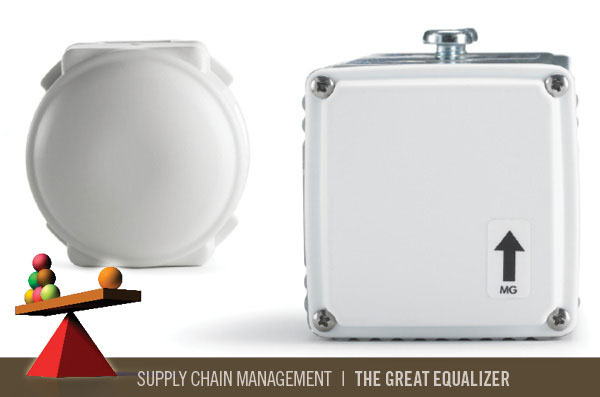 Zebra Technologies' DART locators and sensors enable workers to track assets moving throughout the warehouse. A new wave of strategic software acts as a force multiplier, giving you greater supply chain power. From inbound to outbound, from planning to execution, technology solutions give companies of all sizes the chance to play harder and smarter. Here's a look at some recent logistics IT innovations. Imagine two teams working for a food service distributor, each doing its best to increase supply chain efficiency and manage costs. The replenishment team works hard to ensure customers always get the product they need—ground beef, for example—but that there's never any excess inventory. The logistics team works just as hard to fill trucks completely, to keep down per-unit transportation costs. "The logistics team might ask the replenishment team to buy 40,000 pounds of meat instead of 36,000 pounds, increasing the total dollar amount on the truck by 11 percent," says Steven LaVoie, CEO at Arrowstream, a Chicago-based technology vendor. Craft Brew Alliance (CBA) is a small firm with a big, important friend. Formed from the merger of three craft brewers—Widmer Brothers Brewing, Redhook Ale Brewery, and Kona Brewing Company—CBA generated revenues of $149 million in 2011. But CBA had relied on its relationship with beer giant Anheuser-Busch for its distribution since the 1990s. Today, Anheuser-Busch owns 32 percent of the craft brewing company. CBA shipped beer from its three breweries—in Portland, Ore.; Woodenville, Wash.; and Portsmouth, N.H.—to 12 Anheuser-Busch distribution centers around the United States. The DCs then delivered orders to the wholesalers that make up CBA's customer base. But a few years ago, Anheuser-Busch started closing those DCs. Too small to run facilities of its own, CBA started a transition to a direct-ship distribution strategy. "At the same time, we were looking at an enterprise-wide supply chain solution," says Kyle Jennings, senior director, supply chain at CBA in Portland. The solution that CBA chose—the Voyager suite from Atlanta-based technology provider Logility—included a transportation module that would support the new distribution pattern. In the past, CBA breweries shipped full truckloads to the DCs. "Workers picked and packed orders to build loads for wholesalers," Jennings says. With the transition to direct shipping, CBA would have to build and route those deliveries. "We have to look at what makes sense from the transportation side," says Jennings. "What are our minimum stop quantities? How often can we deliver to locations and still be cost effective? We built those functions into the Logility tool." CBA executives feared that without Anheuser-Busch's DCs, the cost of shipping beer to customers would rise by as much as 40 percent. "Actually, our freight budget only increased by eight to 10 percent," Jennings notes. That's due in part to the fact that CBA now enforces minimum order quantities, but Logility's Transportation Performance Management (TPM) software helps as well. "Now our trucks make multiple stops, optimizing that routing for us," he says. Not only didn't the switch to direct shipping add major costs, but the TPM software helps CBA maintain high service levels. "For the past three months, we've been at approximately 99.5 percent in-stock," Jennings says. Along with TPM, CBA implementedVoyager planning modules for demand, inventory, manufacturing, and replenishment planning, automating functions that it used to perform on spreadsheets—if it performed them at all. Gaining a better picture of current inventory and future demand allows the breweries to design their production schedules more efficiently. "We've also provided visibility out for a few months, so they can better plan their labor," Jennings says. The company has also seen a 60-percent drop in the volume of "aged beer"—product it has to write off because it has been sitting in inventory so long wholesalers will no longer accept it. With greater visibility and better planning, CBA can compete in the beverage market as though it were a larger company. "Many of our competitors don't have the software intelligence we do," Jennings says.